State trust land parcels within the Verde River watershed are noted in the light blue. Map Credit: The Nature Conservancy. State trust lands are an important land ownership category in Arizona, comprising nearly 9.2 million acres throughout the state. 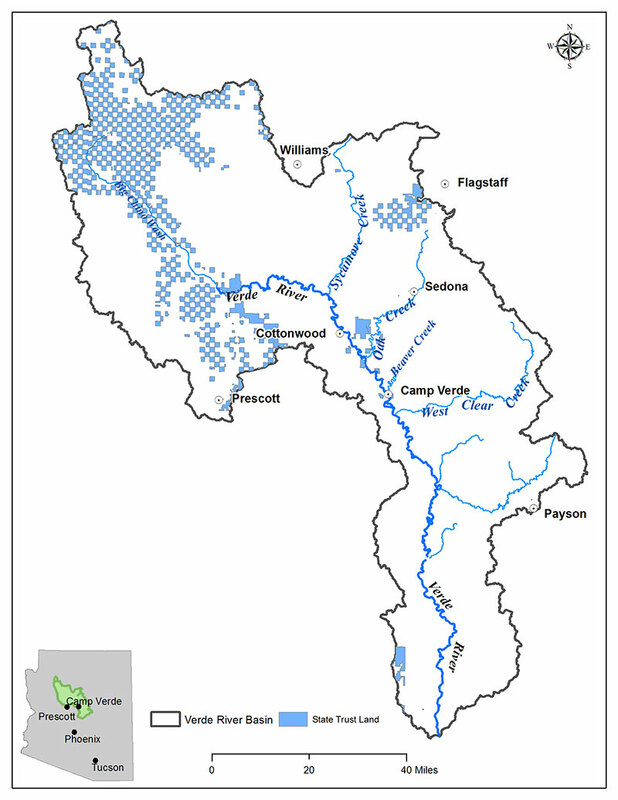 In the Verde River basin, there are nearly 380,000 acres of state trust lands, the majority of which are interspersed in a checkerboard pattern across the aquifers that feed the base flows in the upper Verde River watershed. State trust lands have a unique history and purpose that is quite different from any other state or federally owned public lands. Trust lands were formerly held by the federal government, but were conveyed to Arizona at statehood by Congress to provide support for essential public institutions, primarily public education and K-12 schools. Arizona originally received approximately 10.5 million acres of trust land in its original grant in 1910. Typically, the general public does not often distinguish public lands held for multiple use, recreation, or conservation from state trust lands, but the mandate for management of state trust lands is quite different. State trust lands, as their name implies, are held in trust by the states, which have a fiduciary duty to manage, lease, or sell these lands to generate revenue for the identified public beneficiaries. The fiduciary duties created by the trust relationship established in the Arizona Enabling Act and State Constitution require that the lands be managed in the best interests of those beneficiaries. However, the Arizona State Land Department recognizes that to meet the long term, intergenerational needs of trust beneficiaries, it requires a holistic approach to managing the trust land portfolio. The current approach is to proactively identify opportunities for generation of value, including the exploration of new and emerging markets for revenue generation. Protection of Verde River flows could yield significant regional and statewide benefits in terms of sustaining watershed values, including community water supplies and economic prosperity related to the outdoor recreation economy. However, some constraints remain on the participation of state trust land managers working toward achieving these goals with trust land holdings. This Toolbox is intended to explore tools that can balance the fiduciary mandate of the trust for the beneficiaries through revenue generation, while also examining opportunities to protect critical ecological functions in the Verde watershed.